Simple shapes and hand craftsmanship ensure the enduring beauty of these Balinese-inspired earrings. Traced with beads of granulation and a 4mm center stone of your choosing, they are always appropriate! 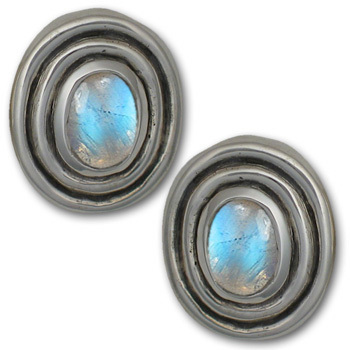 I've been buying from Moonstone for my family for years. These Balinese earrings, in garnet, are just perfect for my wife. She does not like long dangling earrings, and these are great. I love the contrast of the dark background with the center stone and the small design elements surrounding the stone. Just an aside, I am also a huge Gaudi fan and buy Gaudi items for my wife and daughter also. I wished there were some men's Gaudi items. Keep up the great work Moonstone.